Starting at one corner of your home, set your ladder up against your roof and climb to the top to reach your gutters. If your ladder has a hook, place your bucket on the hook. If not, place the bucket on the roof. Next, put on your gloves. Use your hands to scoop out and remove leaves, twigs, and other debris that’s in your gutter and place the contents into your bucket. After you’ve removed the debris, inspect the gutter to make sure everything is gone. If necessary, use a garden spade (or another hard tool) to scrape any debris that has hardened onto or in your gutters. Next, use your garden hose to wash out the gutters. 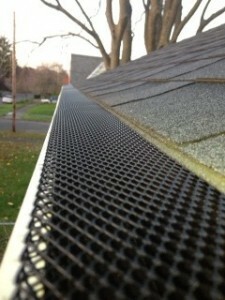 Replace your gutter cover and continue onto each section until all of your gutters have been cleaned.